We all know there are many fundamental tools and techniques to evaluate an investment related decisions. 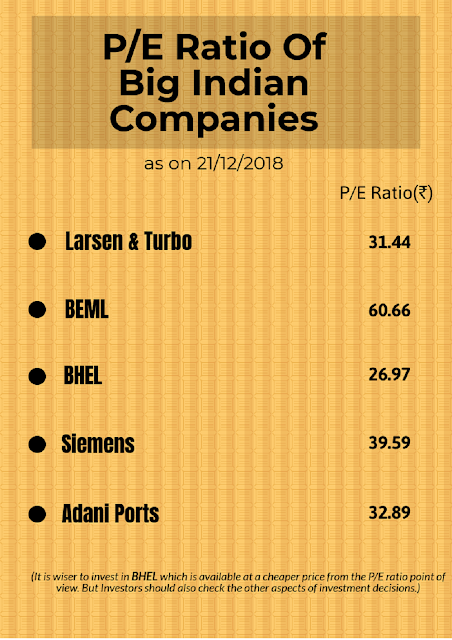 One of them is P/E Ratio of the company while you are going to invest in any share. So in this post, we are going to discuss what is the significance of this ratio and how to use it in while investing in any company. Let's start. The basic definition as per Investopedia is "The price-earnings ratio (P/E ratio) is the ratio for valuing a company that measures its current share price relative to its per-share earnings. The price-earnings ratio is also sometimes known as the price multiple or the earnings multiple." Though it is already in simpler words I want to make it more simple by saying that 'P/E Ratio is nothing but the payback period of your money. That may be something which can confuse peoples who know about P/E Ratio but it is perfect for a layman to understand what is P/E Ratio. I'll also show how this ratio can be treated as payback period of your investment through example. So let's check a case study. The formula to calculate P/E ratio is market price of its share divided by basic EPS. Facebook has an EPS of $6.63 for the quarter ending September 30, 2018. Its market price as on December 21, 2018, is $124.95. Now if we go by formula then P/E ratio would be 18.85. But look at the formula given above and try to understand what is happening. EPS is the earning per share in a year. I will earn $6.63 in a year and my market price is $124.95 and by dividing it with the EPS I'm getting a number which shows how many years it will take to get my money back. If I assume everything is constant and I started to earn $6 each year then it will take 18.85 years to get my investment of $124.95 in Facebook share. I hope it is clear now. One of the definitions which are also easy to understand is "P/E ratio is the amount of money you are investing to earn a rupee." This definition is important when it comes to decisions making by using this ratio. Now let's check how to do that. How to use P/E ratio for purchasing shares? Let's take the example of Reliance whose P/E is 20.02 and its peers BPCL whose P/E is 9.76 and HPCL whose P/E is 5.85. Now let's study how to use this ratio for purchasing any of the three shares. Suppose I'm an investor. What will I want? I should get maximum profit by investing less. But as for formula, I'm getting ₹1 by investing 20.02 in Reliance, 9.76 in BPCL and 5.85 in HPCL. 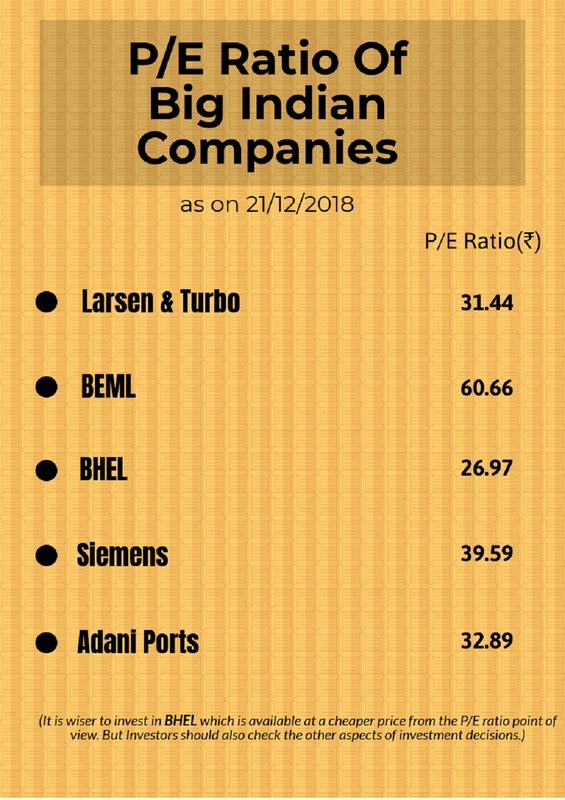 If I assume that every other aspect of these three companies are constant then it is wiser to invest in HPCL because I have to invest as low as 5.85 to earn one rupee of profit. Again I'm saying this is the way to check if a company is available in the market at a cheaper price but we have to check the other aspects also who are important in investment decisions. Let's take few other examples. Rule of thumb is to always invest in shares which have P/E ratio less then the industry's average P/E ratio with a growth intent of management. So basically this ratio is very important to know the valuation of the company. If P/E is low then the company is available at a cheaper price and if P/E is high then it is expensive to buy. That's the reason I personally always watch this ratio before investing in any share. I hope this article will help you in your future decisions regarding investment related decisions. That's all for now.